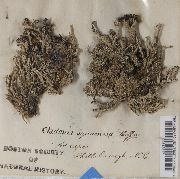 Primary thallus: squamulose, persistent; squamules: 2-6 mm long, 1-3 mm wide, deeply incised, narrow-lobed to coralloid; upper surface: light grayish-green; lower surface: white, esorediate, involute or flattened podetia: (4-) 20-70 mm tall, greenish gray to dark brown, unbranched to much-branched; apices and axils: perforated surface: esorediate; cortex: at base rarely continuous, breaking up above base and giving rise to abundant podetial squamules; squamules: subdigitately lobed, up to 6 mm long, upturned, imbricate, obscuring apical openings, sometimes appearing granulose Apothecia: uncommon, pruinose, later brown, in groups around margins of openings, 2-3 mm diam ascospores: oblong to ellipsoid, (5-) 7-17 x 3-5 micro meter Pycnidia: on tips of podetia (rarely on basal squamules), barrel-shaped, slightly constricted at base, with pale red or hyaline gelatin conidia: 3-8 x 0.5-1 micro meter Spot tests: K- or K+ yellow, C-, KC- or KC+ yellow, P- or P+ yellow, UV+ ice blue or UV- Secondary metabolites: two major chemotypes known: (1) squamatic acid (K-, P-) and (2) thamnolic acid (K and P+ yellow); both contain additional barbatic acid in apothecia, only the second is recorded in our region but the first is also expected. Habitat and ecology: on mossy rocks, rotting wood or tree bases, primarily in temperate regions World distribution: on all continents Sonoran distribution: Chihuahua (Parque Recreativo El Creel). Notes: This species is frequent further south in Mexico (Ahti 2000) and also further north (Hammer 1995). More records are expected from the moister parts of the mountain forests in the Sonoran region. 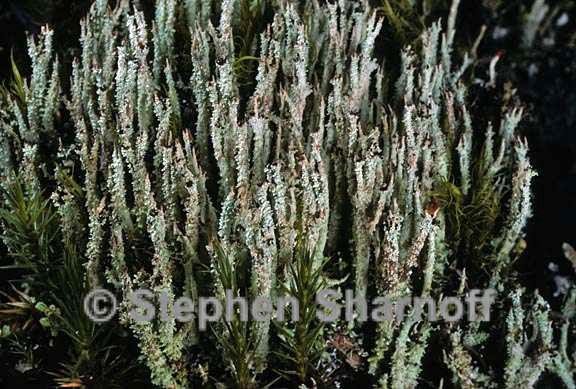 Cladonia squamosa is distinguished by its highly squamulose, brown to gray podetia. The thamnolic acid chemotype was previously identified as C. subsquamosa (e.g. Thomson 1967), but the name is illegitimate (see below under C. subsquamosa Kremp.). There seems to be no morphological character to support its distinction as a species, although its geographic distribution is somewhat different from C. squamosa s. str.